Having a place to socialize and relax seems to be a reoccurring theme for American service people, diplomats and media no matter what country they are in. This was no different in Taipei. Very shortly after the ROC came to power in Taiwan, Madame Chiang Kai-shek apparently had the Friends of China Club built. This was in the early 1950s and was meant mainly for couples. 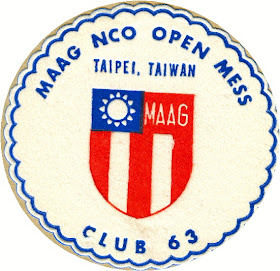 By the 1960s, there were clubs for officers, enlisted personnel and their families. Here are some pictures and souvenirs from this time. The MAAG Officers' Club was on the west side of Chung Shan North Road, near what is now the police station. The enlisted personnel club, was on the sight now occupied by the American Club. 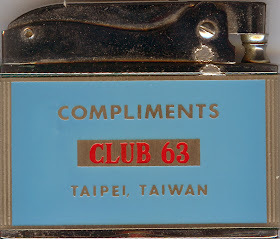 Officially, it was the Club 63, but we used the Chinese numbers for 6 and 3 to get our taxi ride there. 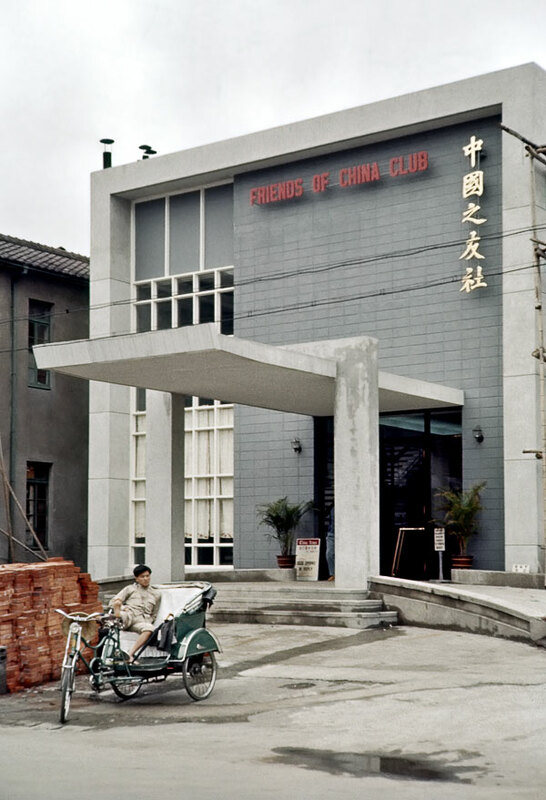 This is a 1957 photo of the Friends Of China Club. Ready for another fare is a pedicab driver. 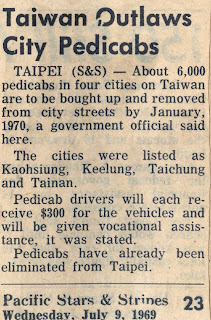 By June of 1968, when we arrived, they had been outlawed in Taipei. 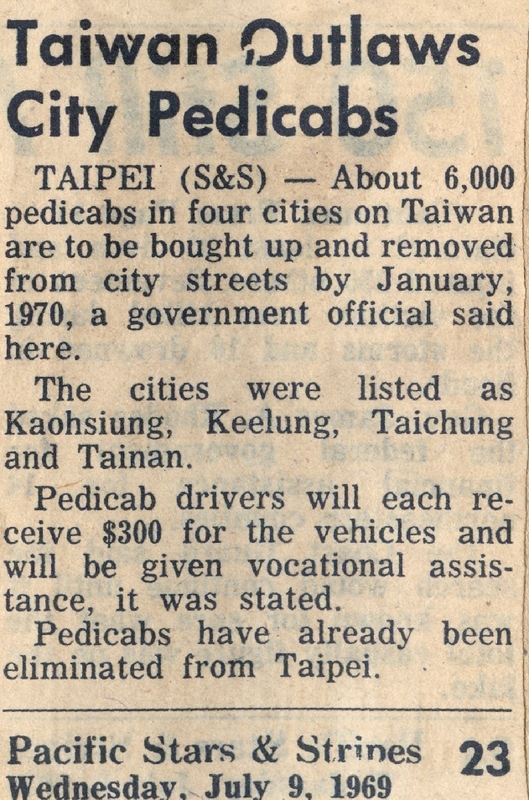 The word was that, in Taipei, many of the former pedicab drivers became pilots of the thousands of Datsun Bluebirds which could be found everywhere in the city. 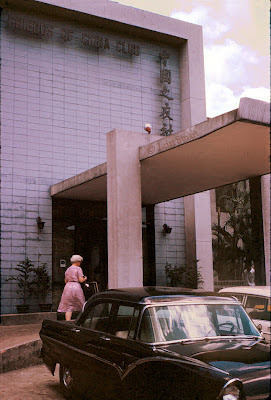 This club was located directly across from the Presidential Palace. It was preceded by a place called the Lucky Bar. This car looks like a mid-50s Ford. 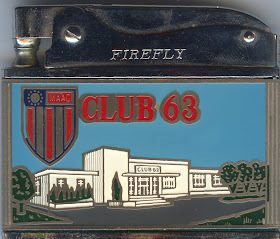 Here is a picture taken directly in front of the Club 63. By the mid-1970s the name was changed to the China Seas Club. We took this picture near dusk near the stag bar. it can't be seen here, but it was a separate building. Saturdays there meant free pizza all afternoon and happy hour when drinks were just a dime apiece. Also, just inside the side entrance to the club was a small dining area. It couldn't have had more than 10 tables, but it was very convenient in case you didn't want to enter the main club room. Across the street from where this picture was taken was a locally famous Mongolian BBQ. 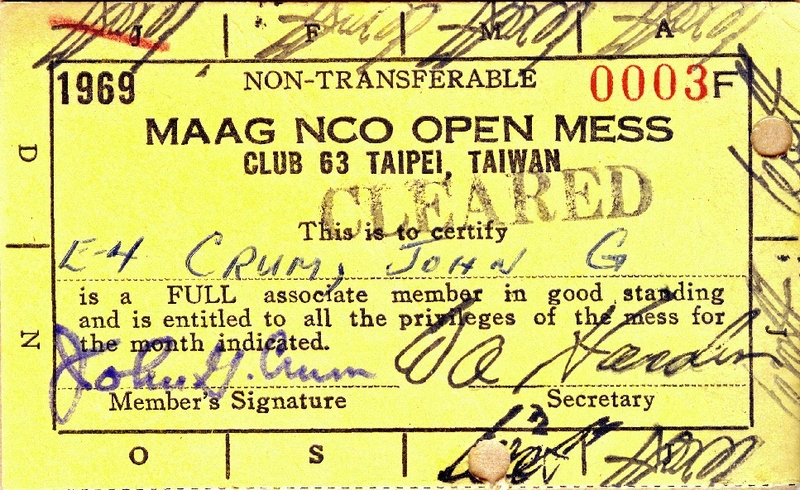 Being of a lower enlisted grade, we could not be full members which, I believe, meant we had no voting privileges. Notice, however, that we were FULL associate members, whatever that meant. What was important was that we were in the monthly men's night crowd, which was a unique experience. 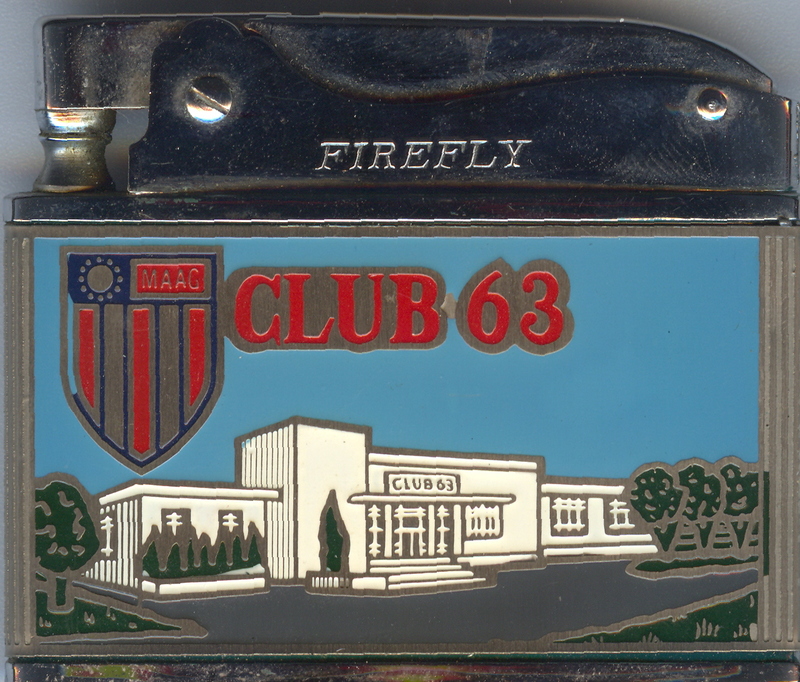 After we paid our initial dues in June of 1968, we were given this cigarette lighter. Being a non-smoker, I put this lighter, which came in a small box, in my duffel bag and later in our cedar chest. There it stayed for over 40 years until being scanned for this blog. 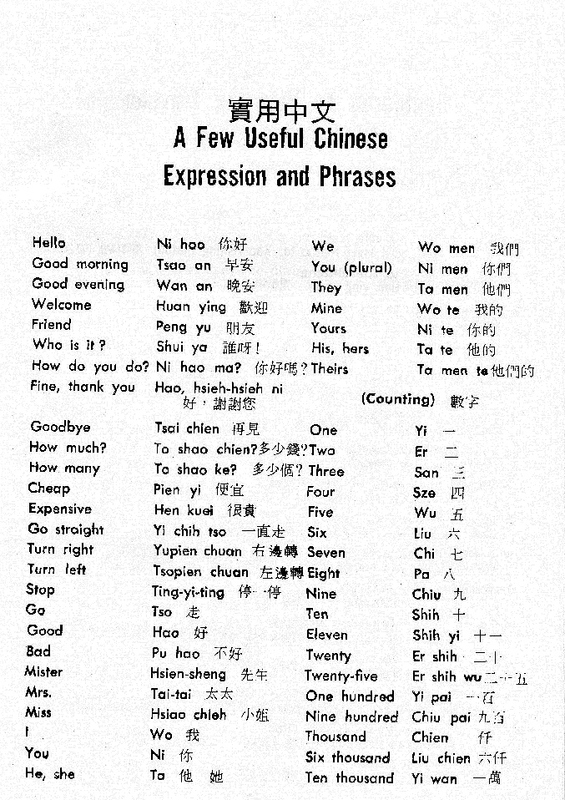 This page came in handy many times. 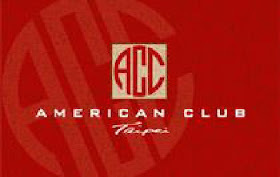 This is the banner for the Taipei American Club, officially known as the American Club in China. 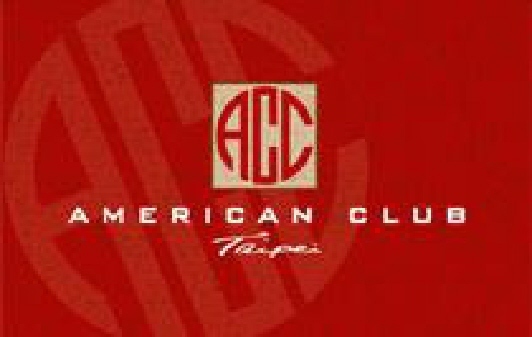 Located on the land once occupied by the Club 63, The American Club is very lavish and offers many amenities for those who have memberships. It is actually quite large. One photo only doesn't convey its vastness. Notice the Grand Hotel in the background. 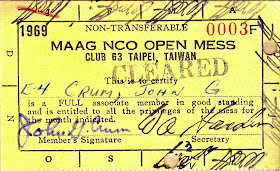 The street address of the club is 47 BeiAn Road, Taipei. Even the parking is organized. Membership is multinational with reciprocal agreements with clubs in other countries. 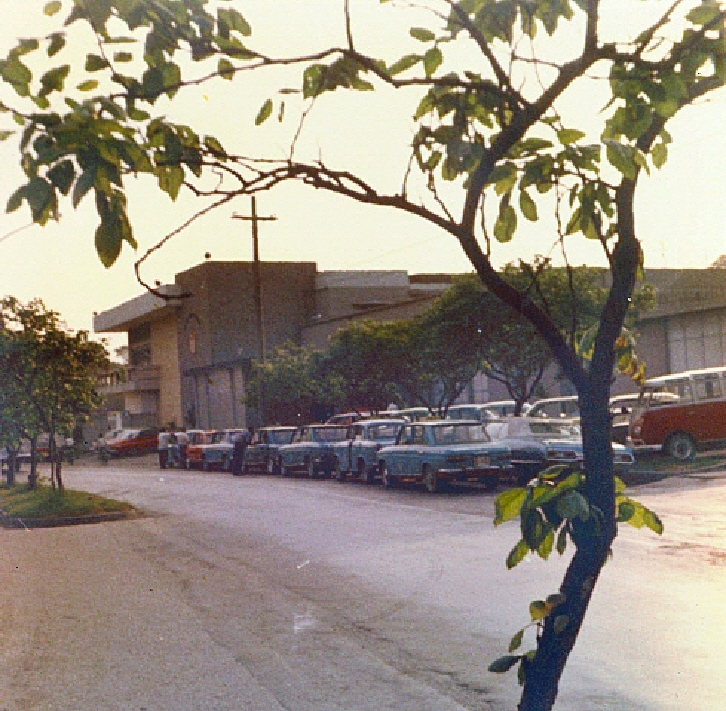 This parking lot may be on the former location of the stag bar. The Martyrs' Shrine was located just a little further east on the road from the 63 Club. It actually opened in 1969. After we left the car to take pictures, the two soldiers exchanged places and came to attention. We thought it was a nice gesture since we were the only people around. The Club 63 became the China Seas Club sometime during my tour in 1973-74. The name change came with the new management, which was the Navy. As I recall, slot machines were reinstalled in the club at that time. I'm hoping that someone who visits this site might be able to help me. 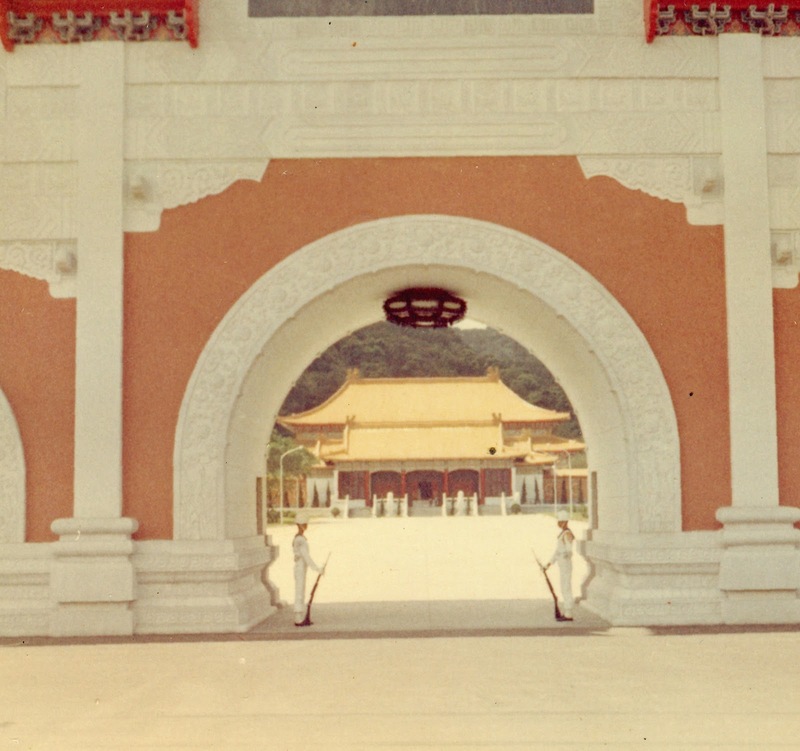 I found film of Taipei in 1956 after my father's passing, and I'm trying to identify places shown. In particular at this point, I'm trying to find what the address of Terry's American Restaurant was. If anyone would know, please contact me either at todezwis@yahoo.com, or through my You Tube account, where you can see the film at this link: http://www.youtube.com/watch?v=PTsWgxptxus (copy & paste) Terry's appears at :22 on the left. Thank you very much for your time and attention! We are on it. I have a couple of contacts who may know something about the restaurant. I suppose the street at 0.07 thru 0.26 is Zhungshan North Road. Please notice the Yangmingshan hills in the background. The building on the left at 0.07-0.12 is probably the MacKay Memorial Hospital? I'm not sure if the building on the left at 0:23-0.26 is Terry's American Restaurant? 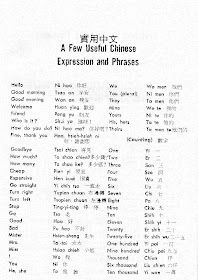 Please refer to the third photo of the following website. The address of the small building with red words(豐年社) on the right in the photo is No.43 Sec 2 Zhungshan North Road. 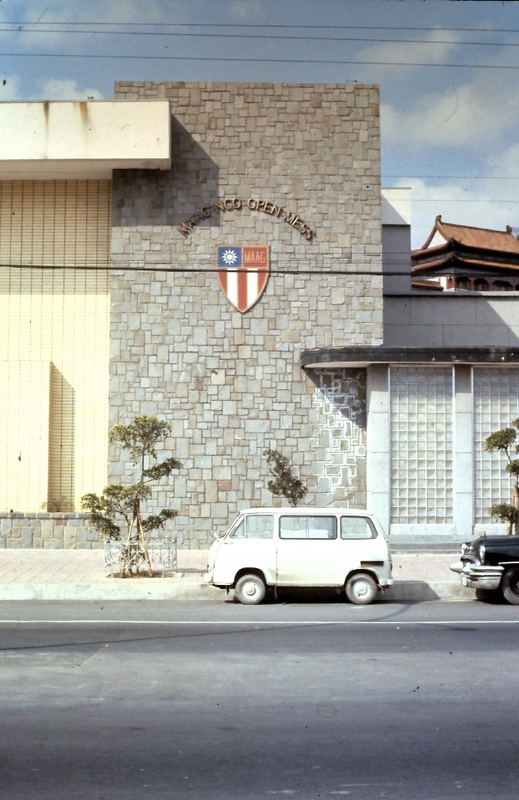 The building on the right at 0:23-0.26 shares resemblance with the building in the first photo of the following website, which was taken on Sec 3 Zhungshan North Road instead on Sec 2. The building at 0:39-0.46 is probably the Golden Dragon Restaurant of Grand Hotel back in the 1950s. 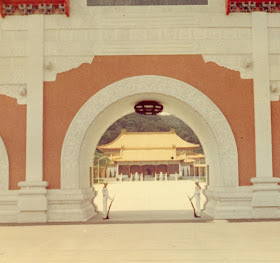 I believe it is Taipei Confucius Temple at 0:47-0:51, and Taipei Botanical Garden at 0:51-0:56. Sam Vona sas in the club mgt and Sgt Kalama was the officer in charge. I worked there as a sgt-at-arms andnight manager 1970-1973.